This is a project that I’ve been wanting to do for a while — I swear I didn’t wait until the week of Independence Day just for the sake of the title! 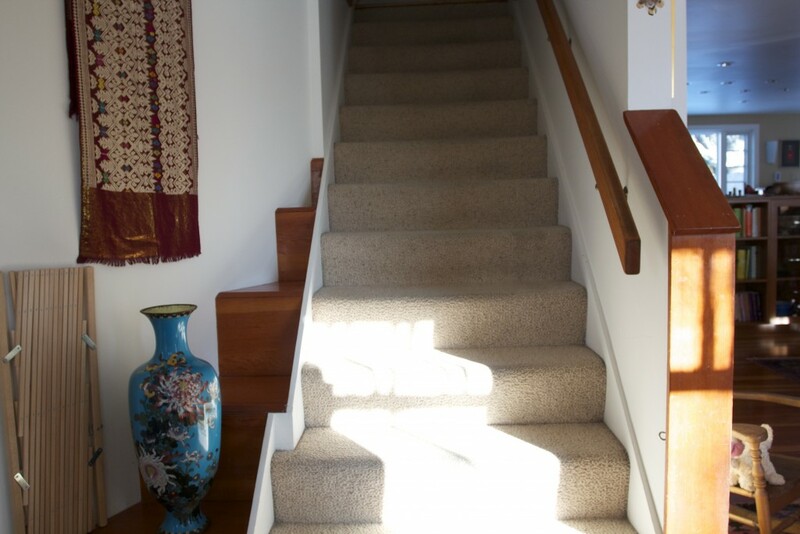 Our stairway is the first thing you see when you come in the front door. It’s got some pretty details like the wood steps to the left of the treads at the bottom, but the carpet was stained and pretty worn. I love the look of striped stair runners, and have wanted to follow the example of my favorite bloggers who have added them recently (see Jenny Komenda’s here, and Grace Bonney’s here). 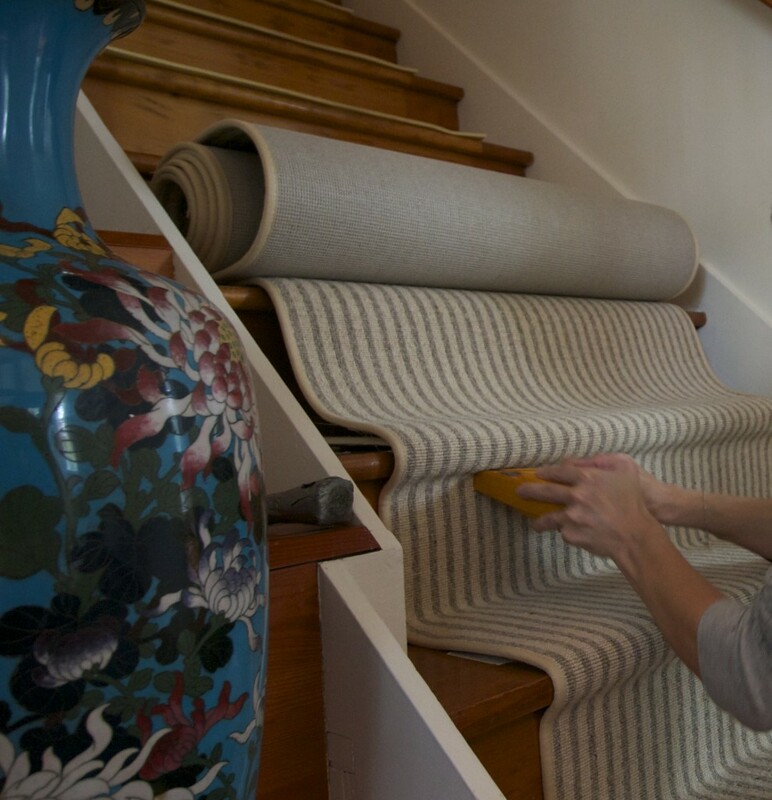 I had decided on a striped runner from Dash & Albert, but when I contacted the company they said that they do not recommend unbound rugs — rugs without a carpet-like backing — on stairs. I hadn’t thought of it before, but it makes sense that an unbound rug would have the potential to stretch and slip over time. Between the dogs, the cats, and the three of us, there are literally 22 feet that go up and down the stairs over and over again each day. 22 feet. So we need something durable and super safe. 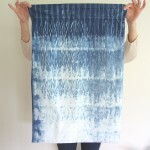 I looked for a striped runner with a backing and couldn’t find anything, so then I switched gears and started looking for carpet that I could have cut into a runner. 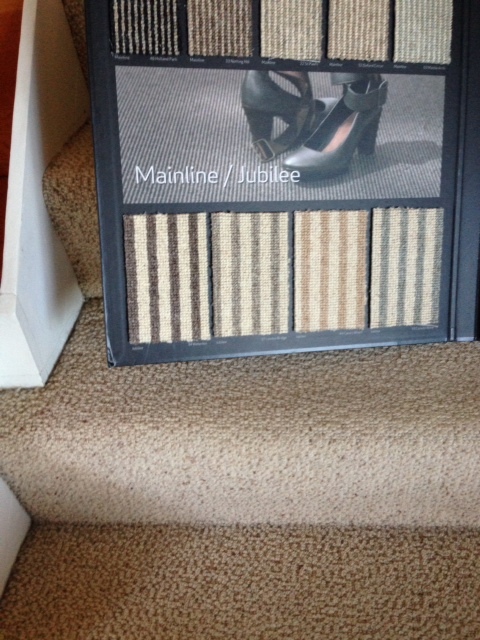 After lots of hunting and many pictures texted to Katie I found the perfect thing: a 100% wool carpet called Jubilee, in the color “London Bridge” by Prestige Mills. London Bridge is second from the left. I measured multiple times (this becomes important later) and then ordered the carpet. Then I waited. And waited. 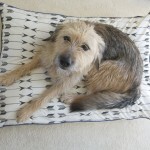 Three months later I unrolled a gloriously preppy striped runner and got to work. I had already peeked before I ordered the runner, so I knew that underneath the carpet was finished fir, just like the rest of the house. When I removed the carpet from the bottom step I was encouraged by the condition of the wood and surprised to find the shadow of an old runner. Chester took Opal camping so that I could do this project without fear of her being gravely wounded by carpet strips or stray staples. You might be thinking ‘come on Mera, no one ever got gravely injured by staples’ but you didn’t see my stairs. There were enough staples to kill a grown man. So. Many. Flippin’. Staples. 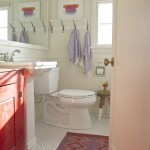 Once I pulled up the carpet, I was happy to realize that I could reuse the carpet pad underneath it. I just cut it in place to the size of the runner. The next thing to do was remove the paint from the edges of the treads. It was about this time a friend showed up and gave me a chocolate cupcake. That, and ten episodes of the Podcast Snap Judgment, got me through the next tasks. After experimenting I found that the best way to remove the paint was to gently scrape with a chisel. By holding the chisel blade just right — basically level with the wood — I could scrape only the paint off and not damage the wood at all. Once I scraped all the old paint off the wood, I painted the edges of the walls adjacent to the stairs that used to be covered by carpet. Then I gave the treads and risers a coat of water based polyurethane, and let it dry overnight. The next morning I set about actually installing the carpet. Because it’s truly carpet and because I was concerned about stability, I installed new carpet strips on the back edge of each tread, about an inch in front of the riser. I was also worried about laying the carpet straight, since wandering stripes would make any deviation really obvious, so I measured four inches out from the wall on both sides of each tread and put a piece of tape down as a guide. That really helped because as I rolled the carpet up each step I could tell whether I was keeping it straight. Starting from the bottom riser, using an electric staple gun, I stapled on the bottom edge in the middle and then worked my way out to each edge. Because I wanted the runner to contour to the edge of each tread (the French cap installation method rather than the waterfall method — listen to me and my fancy carpet jargon — I did a lot of googling during this process!) 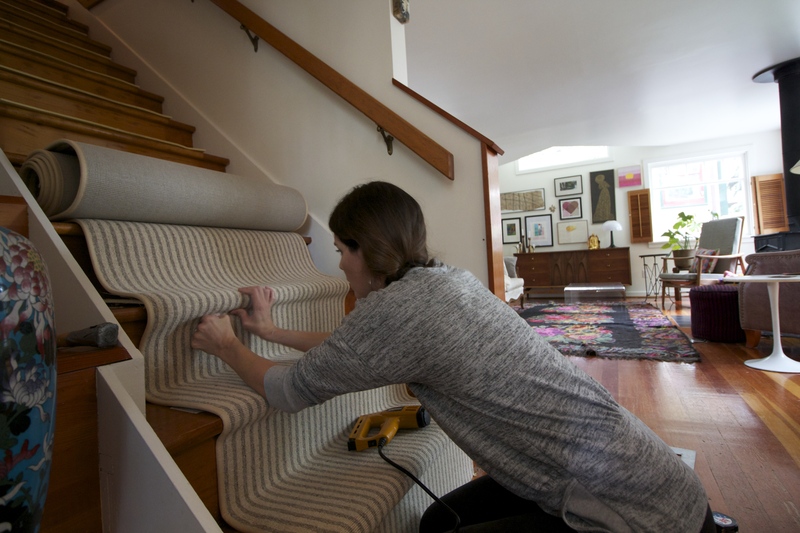 I then stapled directly below the nose of the tread and wrapped the carpet over the top of the step. On each step I stretched the carpet as tight as I could and, using a stair tool, hammered it into the space between the back of each tread and the bottom of each riser. Then, using the side of the hammer, I rubbed over the top of the carpet strip to make sure the rug was firmly on the tacks. I added a few staples to the bottom of the riser, then repeated the process of wrapping the nose of the tread above. I was careful to staple only into the gray stripes, and because of that the staples are pretty much invisible. All went smoothly until I got to the very top. As I was cresting the final riser my stomach sank as I realized the runner is too short. Too mother blanking short. By like three inches. I swear I measured this thing so many times, and I thought I would end up with ample left over. For a brief and hopeful moment I thought maybe the company had messed up on the length, but I went back and checked my order and nope, they got it exactly right. All I can figure is that even though I knew it would take extra length to go under the treads French cap style, I underestimated the additional length I would need. Damn it! So now my options are to (1) call the company and see if they will sell me a remnant that I can patch in; (2) rip it out and reinstall it so that the bottom riser is exposed but the top is covered; or (3) just leave it and forget it. What should I do? Apart from my utter failure to measure properly, I really love the way it looks. It’s soft underfoot, and it doesn’t budge an inch, even with all the traffic it’s subjected to. Thanks for reading along, and have a great Fourth everyone! There’s certainly a lot to celebrate about this wonderful country! It looks so great, well done! I just love stripy stair runners. 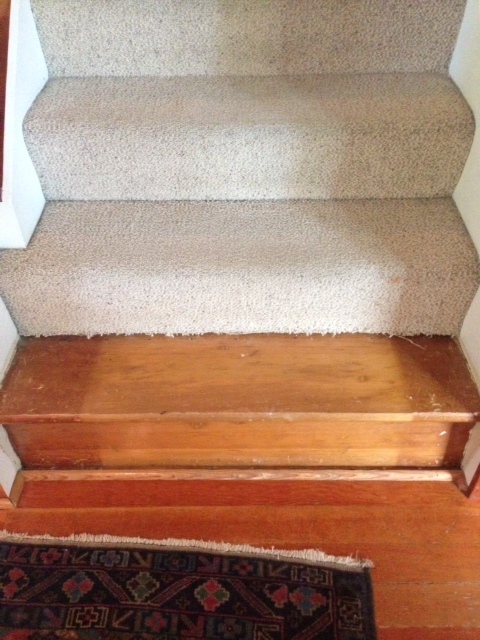 Could you just rip up the first section on the bottom riser, cut it off and then re-attach it at the top of the stairs? I agree with Emily. If doable, I think that’s the easiest fix. It looks great, Mera. I so admire anyone who has the patience to work with difficult to match and/or keep straight patterns, like stripes. 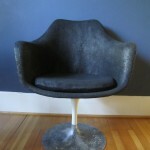 And having once spent a combined 24 hours in a stairway ripping up carpet, pulling out staples (so. many, staples. 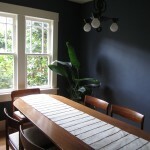 ), painting and refinishing, I know just how much work you put into this project. Thanks for feeling my pain on this one, Nina! 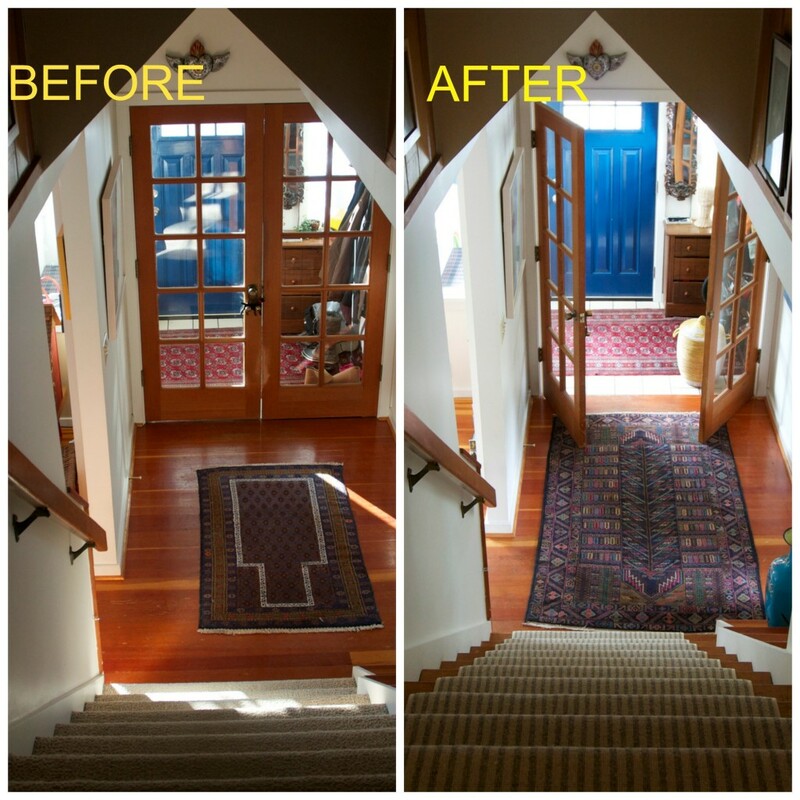 I too have removed carpet from stairs, a landing and two bedrooms off the landing. Yikes. SO many staples. You obviously worked with painstaking attention to present us with this beautiful, if short, end result. I hope the manufacturers can send a piece so you can patch your way to the top, but, if not, I’d live with it as is unless it’s worth it to you to remove it all and start over leaving the bottom riser uncarpeted. Beautiful selection of carpet as well! 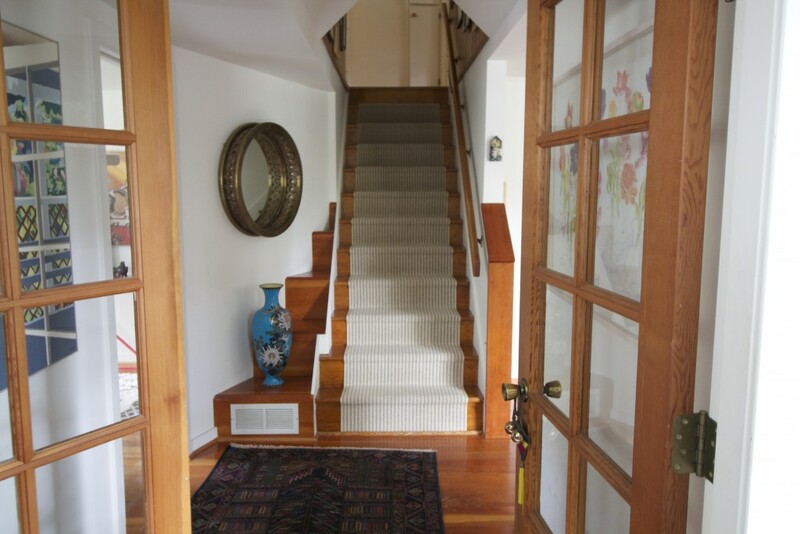 Removing carpet from stairs, a landing, and two bedrooms is a huge undertaking, wow! I am really hopeful that I’ll be able to get a small piece to patch in, and other than the mis-measuring I really think it looks pretty great. Thank you, Susan! Ideally the new runner will last a long time. That’s a long time of looking at a bare spot at the top of the stairs if you don’t get additional material. 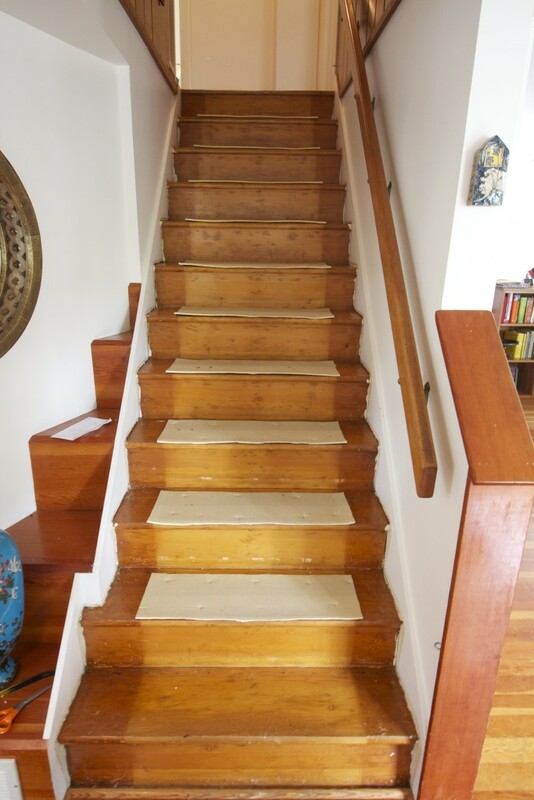 I think it’s worth trying to acquire an additional piece, ideally not just the few inches that you are short, but enough that you could remove the newly stapled down carpet from the entire top step and replace it with the additional piece. If you can get a piece that size it would be a much smaller do-over than tearing it all out and you’d end up with full coverage instead of a naked bottom riser. Thank you, Lea, that’s what I’m hoping for too! Mera – you are some kind of brave and crazy woman to undertake this project. There’s no way I would ever have tried to do that (I was going to say “at your age” but really mean “at ANY age”) and totally commend you for doing it. But I don’t think you should go so crazy far as to take the whole thing off and move it up and leave the very visible bottom riser bare. If you can’t get another piece of striped carpet, maybe you could just paint a trompe l’oeil carpet on that last little bit at the top. 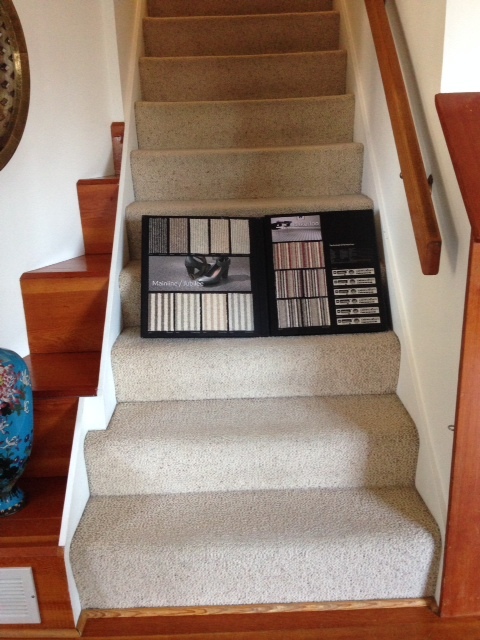 I grew up with stair runners at my parent’s house and grandparents’ houses, and I have to say that I found it a great relief to fully carpet the stairs when I got my own house in 1973. It’s so interesting how styles evolve and revolve. Good luck with your decision! 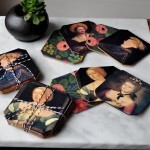 This looks terrific, and I’m confident you will figure out a fix that makes you happy (one that doesn’t involve a lot of pulling your own staples). 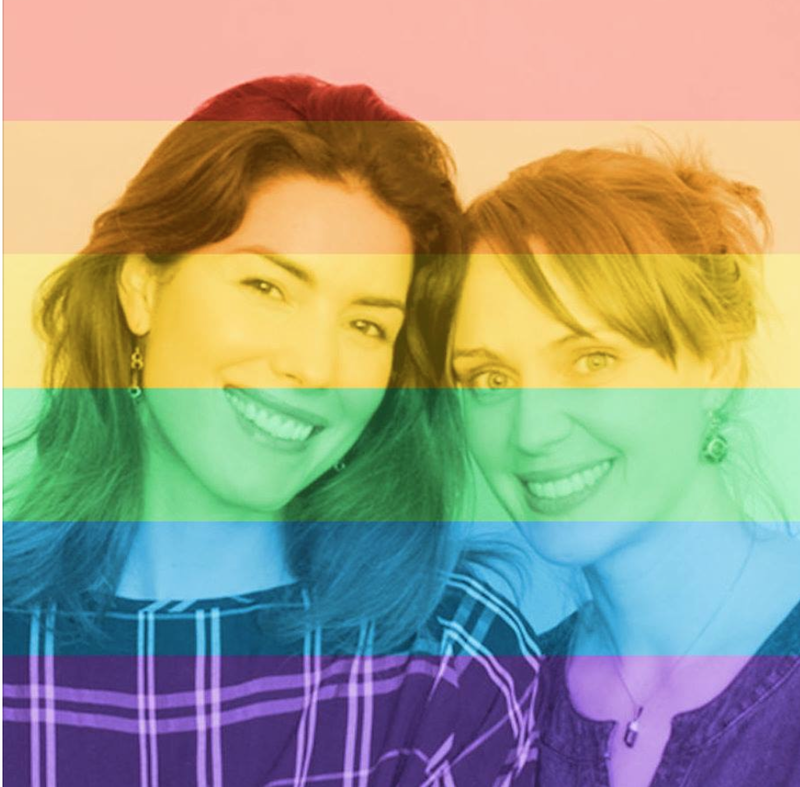 I mostly wanted to say I love the rainbow-hued photo of you and Katie. Seems like we do have, thanks to the Supremes, extra reason to honor this country this year, and your photo such a lovely, subtle tip of your hat to equality and fairness. ooh! looks fantastic! i hope you can find a remnant for this piece. I think I would leave it either way…I can’t imagine trying to remove those staples and start again!